As owners push toward the lowest bid, they often don’t understand how their actions result in higher costs & lower performance. The selection and alignment of expert project teams is the ONLY factor that consistently improves project outcomes for all parties. Based on research tests for more than 2,500 projects and $7B+ in project value, the session will merge owner, contractor, and legal perspectives to offer creative solutions and practical mechanisms to help projects “go right” – or at least help prevent things from going from wrong! Design and construction professionals will learn how to increase their hit rates on proposals. Owners will assess how to evaluate bidder qualifications in a more fair and transparent manner. All stakeholders will gain insight into how to utilize metrics to quantify performance. 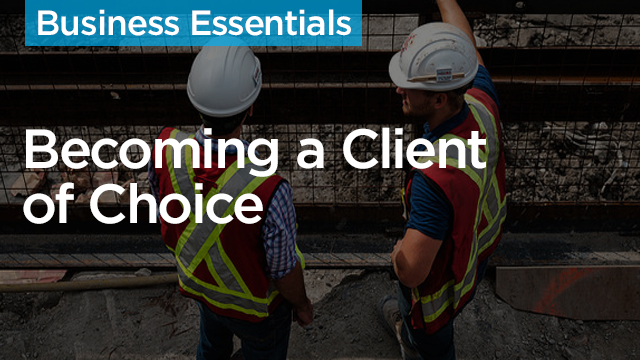 Understand the value of developing owners into a “Client of Choice”.